Speaking of friends, my sweet and funny friend, Peggy (aka marilynprestonn on SCS) is hostessing the Teapot Tuesday challenge this week, and, boy, has Peggy come up with a really darling teapot and story. That girl has a wonderful sense of humor! We're having the tea party at the Rodent's House! My friend Sabrina (cook22) is a little skeered of mice (aren't most of us? ), but Peg-a-roo has reassured her that these mice are all friendly. However, I'm a little concerned that Marilyn's (apandi) elephant might not share those sentiments. Check out the details here, and I hope you'll consider playing along with us. Oh, just a word of caution: Peggy says Mama Teeny is serving up a special eggnog concoction in the punch bowl. After I read the ingredients, I definitely made a mental note to abstain. Even Bertie (my alter ego) has said she will not be partaking of this libation! However, if YOU do decide to partake, I noticed that Judi (aka jovial judi) has brought some candy canes to the party to mask the smell. I think you can pretty much figure out that I drew upon the door and the mice from the inspiration teapot for my card. I masked my little mousie holding his ornament and stamped the door scene (The Journey designed by Asela Hopkins and distributed by Gina K. Designs) over him. I colored everything with my Copic markers. Carla (cmsuto) and Joanne (sleepyinseattle) brought their darling houses if you need a place to hide from all the mice or a place to crash if you do drink that eggnog. I'm thinking Marilyn's (apandi) elephant might have a tough time fitting into one of these teeny tiny homes, but I'm sure he's gonna be freakin' out over all da mice runnin' around. Well, I'm off to go join my other friend, Cathy (aka Mutnik) and her teacup of mouse-a-partiers. They look like they are having a blast! Such a sweet little mouse that is!! I'm not really scared of them - I just don't think they belong in the house. We grew up in a big rambling house with plenty of mice both in the house and garden, and I often rescued the field mice from my cat. But I think my dad feeding them in the kitchen is a BAD idea, LOL. 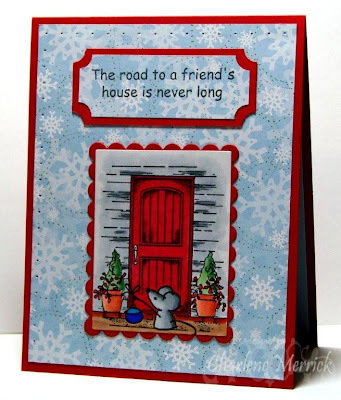 Love this little scene :D.
Love your little mouse at the door Charlene - how cute is this card! and just perfect for Peggy's teapoart! The sweetest little mouse you found there Charlene. I put Maxie to sleep with one shot of eggnog (wink). So glad you came and to know you. I think I know someone who matches my sens of humour, wildness and wackyness too. Love ya Charlene, you are sooo much fun to have at a party anytime! Now isn't your little mouse a cutie and to think he is right there at the front door!!!! No backdoor for that adorable little guy!!! Your coloring is gorgeous, Charlene, and I love all the snowflakes in the background!!! I hope you and yours have a wonderful Christmas!!! I LOVE this card! The sentiment is so true. I Love M & M's too! happy Holidays. Hope your Christmas was happy and that you had some giggles and smiles accompanying your visits and festivities.....and, maybe, some new toys to play with?? ?